The purpose of the independent living skills program for the deaf is to improve the ability of deaf and/or hard with hearing (D/HH) individuals to be self-sufficient. Jet Hurley is the Independent Living Services (ILS) Instructor for the program. Because he is deaf himself, he understands deaf culture and the unique obstacles encountered by members of this group. Any deaf or hard with hearing person, who lives in the Orange County area is eligible for services through the ILS program. Usually, consumers are eighteen or older. For more information please call 714.621.3300 or complete the online form. Most deaf people find out about the ILS program from their friends or other members of the deaf community, who have used DMC services. The ILS Instructor also goes to deaf events to tell people about the program. When a D/HH person is interested in receiving services, he or she comes into the DMC office or calls to talk to the ILS Instructor through video phone. A referral from another agency is not necessary. 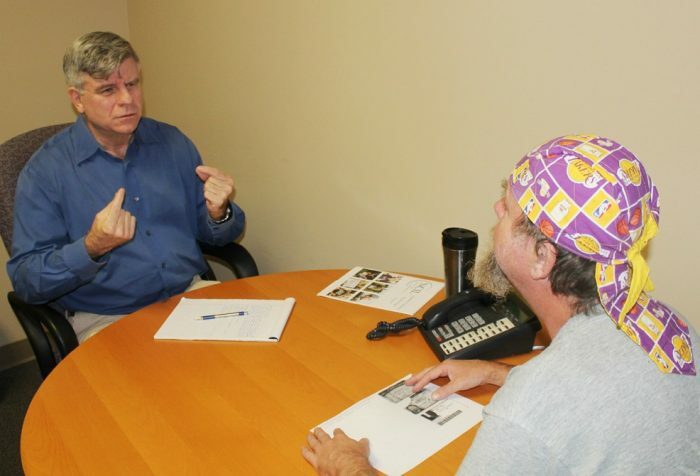 When a deaf or hard with hearing person wants to have independent living skills training, the ILS instructor for the deaf works with each new consumer to complete intake forms. One of the forms is an independent living plan. The instructor helps the person to figure out what training is needed and what goals the consumer wants to accomplish. This information is part of the plan, which is used as a guide for services. Basic independent living skills training include these topics. Self-Advocacy: Learning how to access deaf-friendly community resources, understanding how to define the differences between wants and needs, knowing how to stand up for oneself, making good decisions, solving problems. Communication: Reading and writing in English, asking for and scheduling sign language interpreters, using video phones and relay services. Money Management: Making and following a budget, using banking services, understanding how credit works, paying bills online. Driver’s License Readiness: Reading and comprehending the driver education manual, understanding and passing sample versions of the written test for obtaining a driver’s license. Benefits Counseling: Understanding the eligibility for entitlement programs such as Food Stamps, Social Security Supplemental Income, MediCal, etc. Social skills: Interacting with hearing people, having good hygiene, being polite, understanding body language and social cues. Daily Living Skills: Housekeeping, laundry, shopping, simple meal preparation. Independent living skills training is provided until goals have been reached or the consumer is no longer interested in receiving assistance through the Dayle McIntosh Center. After a case file is closed, a consumer is given an opportunity to complete a satisfaction survey to rate the effectiveness of the ILS program. The ILS program for the deaf worked with a deaf woman, who had to move to an assisted living facility after she had a stroke. She was very upset and did not understand her new surroundings. DMC staff helped her to become oriented and to adapt to the daily routine. The woman was given a device that would cause the lamp to blink whenever someone knocked on her door. In-service training was provided for the staff at the assisted living facility regarding deaf culture and how to best interact with their new deaf resident. A group of volunteer student interpreters were recruited to provide communication for the deaf woman so she could participate in exercise and recreation activities. The consumer has improved greatly by feeling more connected to others and being able to communicate in her native language.